The Commission of Inquiry into allegations of impropriety at the Public Investment Corporation (PIC) will continue in Pretoria on Monday. Last week, board member Dudu Hlatshwayo’s testimony, told the inquiry that a whistleblower named James Noko had been circulating emails on explosive allegations of corruption against PIC board members. Following the surfacing of the James Noko emails, Hlatshwayo described the environment at the PIC as toxic and unproductive. She told of clear divisions on the board but said they however found a way to work together. She added that versions of what transpired when the board resigned differ from that of Deputy Minister of Finance, Mondli Gungubele. The Minister of Finance has since asked the board to continue its work until a new board has been appointed. However, with the confusion about their roles and the resignation of one board member, the corporation remains without sufficient board quorum to take decisions. 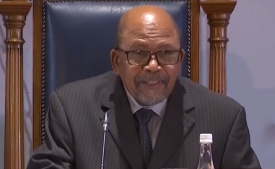 The post More testimonies expected in PIC Commission of Inquiry appeared first on SABC News – Breaking news, special reports, world, business, sport coverage of all South African current events. Africa's news leader..